Drs. Gerald Bird and Jay Johnson provide dental implants at their practice in order to give their patients with missing or failing teeth a second chance at a functional smile. The quality of the care they provide is of the highest importance to them. If your jawbone has deteriorated after tooth loss, it is essential that you consider bone graft treatment to enhance the volume and strength of your jaw before restoring your smile. If you are seeking a Cocoa oral surgeon who has the experience necessary to make the most out of your dental implant and bone grafting experience, look no further; Drs. Bird and Johnson can help. If you have lost a significant amount of bone after losing a tooth and the remaining bone is unable to safely or efficiently support a dental implant, bone grafting may be right for you. An in-depth and educational consultation with us will help determine whether grafting is required before moving forward with your implant procedure. Any major issues in your medical or dental history will make a difference in your candidacy, as will the severity of your bone loss. Using interactive CT scans, X-rays, and other advanced diagnostic technology, we will be able to visualize your teeth, bone, and soft-tissues in order to plan your treatment around your individual needs. During your first appointment with Dr. Bird or Dr. Johnson, we will discuss your options for grafting surgery, the techniques that will work best for you, and the temporary restoration you will wear during the healing period. Complete healing generally takes between four and six months, but your commitment to hygiene and at-home care will help your recovery run smoothly. To help ease the stress of oral surgery, we provide sedation dentistry at our Cocoa practice. On the day of your procedure, we will administer anesthetic and sedation to give you the best dental experience. Our bone grafting surgery is a meticulous process that has been fine-tuned and intensely studied for years. We will prepare your jawbone by creating a small incision in your gums. The artificial or real bone graft will be secured with grafting material. Finally, we will close your gum incisions over the bone. Drs. Bird and Johnson also use plasma-rich platelet therapy to reduce your healing time by up to a month. By taking a very small amount of your blood, purifying the platelets, and applying them to the surgical site, we can accelerate the healing process. 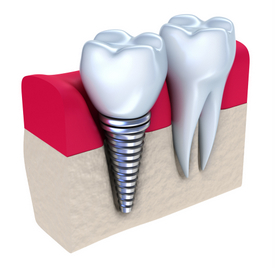 For our patients in Cocoa, dental implants can be used to replace your failing or missing teeth, but if you have been told that you have insufficient bone mass, Drs. Bird and Johnson have the solution for you. Advanced bone graft treatment can augment your jawbone enough to safely support dental implants. Finding such a revolutionary way to replace your teeth will restore your ability to chew, eat, and speak normally, as well as boost your self-confidence. Contact our oral surgery practice today to schedule a consultation.